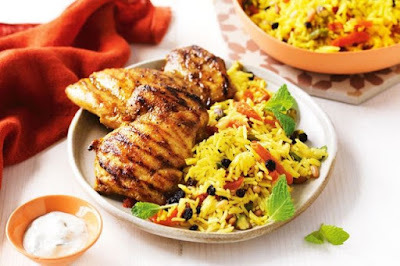 Turn on the BBQ for these easy spiced chicken thighs served with sweet and nutty Persian rice. Place the rice, half the turmeric and 2 1/4 cups (560ml) water in a medium saucepan. Bring to the boil. Reduce heat to very low. Cover and simmer for 10 mins or until liquid is absorbed. Set aside, covered, for 2 mins. Transfer to a large bowl. Meanwhile, place chicken in a glass or ceramic dish. Combine oil, cumin and remaining turmeric in a bowl. Drizzle over chicken. Season. Toss to coat. Heat a barbecue grill or chargrill on medium. Cook chicken for 4-5 mins each side or until cooked through. Add currants, apricot, pistachio and pine nuts to the rice. Season. Stir until well combined. Combine yoghurt, mint, garlic and 1 tbs water in a bowl. Season. Divide the rice salad and chicken among serving plates. Serve with the yoghurt mixture.